Human papillomavirus (HPV) is a naked double-stranded DNA virus, belonging to the family Papillomaviridae. Infection with HPV persists in about 5%–10% of infected women and later develop to precancerous lesions of the cervix which can progress to invasive cancer 15–20 years later. More than 170 HPV types have been characterized and about 40 types are able to infect the epithelial lining of the anogenital tract and other mucosal areas of the human body. Depending on their degree of association with human malignancy, HPVs can be further subdivided into high risk (HR) and low risk (LR) types. lrHPV subtypes are mainly found in genital and skin warts, whereas hrHPV subtypes are frequently associated with invasive cervical cancer. Intermediate risk HPV types are found in the presence of preinvasive lesions. hrHPV types have been reported in 90%–99% of invasive cervical cancers with types 16 and type 18 accounting for 70% of the cases worldwide. Worldwide, about 751 women die from cervical cancer daily and >80% of these deaths come from the Sub-Saharan Africa. In Nigeria, 14,000–20,000 new cases are diagnosed every year, while 9659 deaths occur every year translating to the loss of 26 women every day. This study was carried out to detect some hrHPVs that circulate in Kaduna State as this has not yet been reported and will improve the prospects on the establishment of cervical cancer screening program in the state. This will contribute enormously to the global efforts of prevention and control of HPV infection. The study was hospital-based and cross-sectional; conducted in three hospitals from the three senatorial zones of Kaduna State, Nigeria; Ahmadu Bello University Teaching Hospital (ABUTH), Zaria, representing Kaduna North, Barau Dikko Teaching Hospital (BDTH), Kaduna, representing Kaduna Central General Hospital (GH), Kafanchan, representing Kaduna South, in the year 2015. Ethical approval was granted by the Health Research Ethics Committee of ABUTH, Zaria, as well as from the Kaduna State Ministry of Health, and informed consent (written) was obtained from the subjects before sample and data collection. The Human Experimentation Guideline as stated by Helsinki Declaration of 1975 (revised in 2000) was followed in the conduct of the research. A structured questionnaire was used to collect sociodemographic and clinical information from consenting women. The study population comprised of all consented sexually active women, from age 15 years and above (including patients, caregivers, pregnant women, women with infertility issues, and women attending family planning clinic), attending the selected hospitals. Nonsexually active women as well as those that did not consent were excluded from the study. A prevalence rate of 21.6% for hrHPV from a previous study in Osun State, Nigeria, was used to determine the sample size (276), using the equation derived by Sarmukaddam and Garad at 95% confidence interval. A sterile cytobrush was used to collect the cervical scrapings (exfoliated cells from the squamocolumnar junction of the ecto and endocervix) of 276 women (92 women from each hospital) by a gynecologist. The brush was then rinsed in 5 ml phosphate-buffered saline and stored at −20°C in the gynecology department of the various hospitals until analyzed. All the 276 samples were screened for HPV antigen using enzyme-linked immunosorbent assay (HPV Antigen ELISA Kit in Cervical Swab, WKEA MED SUPPLIES, CHANGCHUN, CHINA) and squamous intraepithelial lesion (SIL) using Conventional Pap smear More Details technique as described by the University of Nottingham Medical School, Division of Histopathology. Out of the 276 samples screened, 24 were positive for HPV antigen and 17 were positive for SIL. A total of thirty samples positive for either HPV antigen or SIL, as well as those positive for both, were subjected to polymerase chain reaction (PCR) to detect the viral DNA and genotypes. The double-stranded DNA of HPV was extracted from the samples using QIAamp DNA Mini Kit (Qiagen, Germany), following manufacturer's protocol. The extracted DNA was used as template to generate copies that were amplified by conventional PCR technique, using first generic primer (MY095'-CGT CCA AGA GGA TAC TGA TC-3' and MY115'-GCC CAG GGT CAT AAC AAT GG-3' located at 450 bp), and subsequently specific primer sets for each hrHPV types16 (Forward: 5'-TCAAAGCCACTGTGTCCTGA-3', Reverse: 5'-CGTGTTCTTGATGATCTGCAA-3', located at 119 bp), 18 (Forward: 5'- CCGAGCACGACAGGAACGACT-3', Reverse: 5'-TCGTTTTCTTCCTCTGAGTCGCTT-3' located at 172 bp), 31 (Forward: 5'-CTACAGTAAGCATTGTGCTATGC-3' Reverse: 5'-ACGTAATGGAGAGGTTGCAATAACCC-3', located at 153 bp), and 45 (Forward: 5'-ACCAGATTTGTGCACAGAAT-3', Reverse: 5'-TTTTTTCCAGTGTCTCTCCA-3', located at 236 bp), (Bioneer, Inc., United States of America). All procedures were carried out following the manufacturer's protocol. The amplification was done in a total volume of 25 μl mixture (12.5 μl of the Master mix which consists of PCR buffer, Deoxyribonucleotide triphosphates, or dNTP's and Taq polymerase, 2 μl each of forward and reverse primers, 2.5 μl of nuclease-free water, 0.3 μl of magnesium chloride or MgCl2, and 6 μl of template DNA). The tube containing the mixture was placed in a thermocycler (Veriti 96-well Thermal Cycler, Thermo Fisher Scientific, USA) which was programmed to run in three steps per cycle. Cycling conditions began with an initial 5 min denaturation step at 95°C for 5 min, followed by 35 cycles of denaturation (94°C, 30 s), annealing (58°C, 48°C, 55°C, 46°C, and 44°C for generic primer, HPV types 16, 18, 31, and 45 respectively, 30 s), and extension (72°C, 30 s). A final extension was done at 72°C for 7 min was performed at the end of the 35 cycles. The amplified products were then subjected to gel electrophoresis using 2% agarose gel at room temperature for size separation of PCR products. Amplicons were determined against a 50 bp molecular size marker DNA ladder (Bioneer, Inc., United States of America). Data were analyzed using the frequency procedure of Statistical Analysis System version 9.2, at 0.05 level of significance and 95% confidence interval. Relationships between variables were determined using Fisher's exact test, Pearson's Chi-square, and Pearson correlation coefficients. Analysis of the study population by sociodemographic features revealed that more than half (52.9%: 146/276) of the respondents were between ages 37 and 56 years and married (78.6%: 217/276). Most were civil servants (51.4: 142/276) with a good literacy level (44.6%: 123/276). Concerning their sexual and reproductive characteristics, a good number (47.5%: 131/276) of the respondents were multiparous women that practice monogamy (81.9%: 226/276) and had their first sexual contact after age 20 years (51.4%: 114/276). Analysis of ELISA result showed that 8.7% (24/276) of the women were positive for HPV antigen, while 91.3% (252/276) were negative. The result of the Pap smear revealed that, of the 276 respondents, 17 (6.2%) had SIL, while 259 (93.8%) had normal result. A total of 30 samples positive for either HPV antigen or SIL were subjected to PCR, of which 20 (66.7%) were positive for hrHPV. hrHPV was detected in; 46.2% (6/13) of women with normal cytology but positive for HPV, one of the two women with atypical squamous cells of undetermined significance (ASC-US), 84.6% (11/13) in those with low grade SIL (LGSIL), and in all (2/2) the women with high-grade SIL (HGSIL) [Table 1]. Further analysis of the individual prevalence of each hrHPV type [Figure 1] revealed that 55.0% (11/20) of the women had HPV type 16, while 60.0% (12/20) of the women had HPV type 18. The prevalence rate of HPV type 31 was 25.0% (5/20), while the prevalence rate of HPV type 45 was 5.0% (1/20). hrHPV was not detected in 33.3% (10/30) of the women that were HPV positive and SIL positive. The occurrence of co-infection between HPV 16 and 18 was found in 25.0% (5/20) of the women, while that of HPV 16 and 31 was found in 5.0% (1/20) of the women. 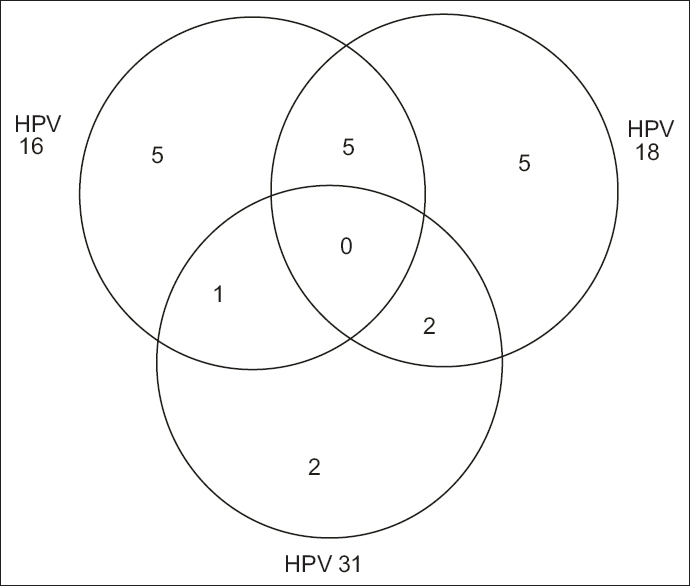 The co-infection of HPV 18 and 31 was also found in 10.0% (2/20) of the women [Figure 2]. The results obtained were further analyzed to see if there was any correlation between infection with hrHPV types and the development of SIL [Table 2]. It was observed that there was a highly significant (P = 0.0001) association (r = 0.75) between infection with hrHPV types and the development of SIL. The prevalence of hrHPV in this study was 66.7% which shows that there is a high possibility of detecting DNA of hrHPV in women that are infected with HPV and those that have cervical dysplasia. It, therefore, means that HPV testing should not just stop at screening for the viral antigen, further effort should be made in checking if the person involved is infected with hrHPV or lrHPV. The obtained prevalence is lower than 76% reported in Kano State, Nigeria, but much higher than those reported by Famooto et al. and Fadahunsi et al., all conducted in Nigeria. The prevalence is also higher than the 8.2% reported in rural India by Aggarwal et al. and 16.1% in Paraguay. The differences in the prevalence rate could also be due to differences in sociocultural habits of the people such as marriage practices, religious policies, diet, medical treatment options, and interpersonal relationships at the different regions. The difference could also be due to the different diagnostic methods used which include PCR, 21 HPV Geno array test kit, and Roche linear array HPV genotyping test. Four hrHPV types were detected, some of which occurred singly and some in combination with other types. hrHPV was detected in 46.2% of women with normal cytology but positive for HPV. This could mean primary infection, re-infection, or persistent infection that has not gotten to the stage of causing cervical lesions. This category of women might develop cervical cancer if not monitored by continuous HPV screening and Pap smear test. In an earlier study with similar results, it was advised that such women should go for repeat Pap test in 6–12-month interval. The prevalence rate obtained here is much lower 22.4% reported by Fadahunsi et al. in Southern Nigeria. The prevalence of hrHPV in women with abnormal cytology was 82.4%. This shows that most women that have cervical dysplasia are likely to be harboring the DNA of hrHPV. These women are, therefore, encouraged to go for a follow-up test and immediate treatment if need be. The obtained prevalence is much >22.7% reported in Osun State, Southern Nigeria, by Fadahunsi et al. This difference in prevalence could be due to differences in the diagnostic methods used. The prevalence of hrHPV in relation to SIL showed that HPV DNA was found in 1 of the 2 women that had ASC-US, 11 out of the 13 women that had LGSIL, and in the 2 women that had HGSIL. This implies that the possibility of detecting HPV DNA in a cervical lesion increases with the severity of the lesion. Women with ASC-US that were infected with hrHPV should have a repeat Pap smear within 6–12 months, while women with LGSIL or HGSIL that are infected with hrHPV should have immediate colposcopy and consequent treatment as the case may be. Further analysis of the individual prevalence of each hrHPV type revealed that HPV type 16 had a prevalence of 55.0% which is much higher than the 15.8% reported in Kano State, Nigeria, 9.2% reported in Abuja, Nigeria, and 4.5% reported in Southern Italy by Ammatuna et al. The prevalence of HPV 18 was 60.0% which is much higher than the 23.7% reported in Kano, Nigeria, 10.8% reported in Abuja, Nigeria, and 1.3% reported in South Italy. The prevalence rate of HPV type 31 was 25.0% which is much >6.2% reported in Abuja, Nigeria and 1.5% reported in South Italy. The prevalence of HPV type 45 was 5.0% which is very much lower than the 13.9% reported in Abuja, Nigeria, but much >0.6% reported in South Italy. These differences in prevalence rates could indicate a different pattern of the distribution of HPV types that might reflect the geographic origins of samples. The difference could also be because this study screened only women that were positive for HPV antigen and cervical dysplasia other than the entire study population, which would have increased the chances of detecting the DNA of hrHPV. The higher prevalence of hrHPV obtained in this study as compared to other studies indicate that the study population is more at risk of cervical cancer; therefore, they should be encouraged to go for Pap smear screening more often and also to avoid exposure to other factors such as smoking, high parity, prolonged use of contraception, among others, that could promote cervical carcinogenesis. About 25.0% (5/20) of the study population were infected with both HPV type 16 and type 18. This is much lower than 60.5% reported in Kano State, Nigeria, by Auwal et al. and but much higher the 0.5% co-infection rate reported in Southern Italy. HPV types 16 and 18 have been reported to account for 70% cases if invasive cervical cancers worldwide. Co-infection of these two HR types places an individual more at risk of developing cancer than infection with either of the two types. Co-relational analysis of the result of hrHPV and SIL revealed a strong positive correlation between infection with hrHPV types and the development of SIL. This implies that an increase in hrHPV infection will lead to a direct increase in SIL and it further affirms existing reports that persistent infection with hrHPV's leads to the development of SIL. The findings from this study have shown that there is a high possibility of detecting the DNA of hrHPV in women that are infected with HPV and those that have cervical dysplasia in Kaduna State, Nigeria. It, therefore, means that HPV testing should not just stop at screening for the viral antigen; further effort should be made in checking if the person involved is infected with hrHPV so that appropriate steps can be taken to prevent the occurrence of cervical cancer in the future. Currently, there are just two vaccines in circulation in the study area, which protects against infection with HPV type 16, 18, 6, and 11. Therefore, detecting HPV type 31 and 45 in the study area emphasizes the need for the government to put in place, policies that will bring about the supply and utilization of the 9-valent vaccine (Gardasil 9) which was approved by the US FDA as this vaccine protects against these two types. HPV genotyping was done using only four type-specific primer sets, although they were selected because of the high prevalence of those types; nonetheless, there could be other hrHPV types that circulate in the state, which were not detected. We thank the Doctors and Nurses of the Obstetrics and Gynecology Department of GH, Kafanchan, BDTH, Kaduna and ABUTH, Zaria, for their assistance in the collection of samples. We also appreciate the head of the laboratory Department of GH, Kafanchan and BDTH, Kaduna, for providing the storage facility for the samples collected. We owe a big gratitude to our respondents for accepting to participate in this study. This study was solely supported by contributors. Frazer IH. Measuring serum antibody to human papillomavirus following infection or vaccination. Gynecol Oncol 2010;118:S8-11. Ghittoni R, Accardi R, Chiocca S, Tommasino M. Role of human papillomaviruses in carcinogenesis. Ecancermedicalscience 2015;9:526. Soliman PT, Slomovitz BM, Wolf JK. Mechanisms of cervical cancer. Drug Discov Today Dis Mech 2004;1:253-8. Thomas ER, Shah KV. Cervical Cancer: From Etiology to Prevention. Netherlands: Kluver Academic Publishers; 2004. p. 79-99. American Cancer Society What are the Risk Factors for Cervical Cancer; 2015. Available from: http://www.cancer.org/cancer/cervicalcancer/detailedguide/cervical-cancer-risk-factors? [Last accessed on 2015 Oct 13]. Onwudiwe E Sexually Active Women Prone to Cervical Cancer. With Motunrayo Joel, in Punch News Paper; 22nd June, 2014. Available from: http://www.punchng.com/health/sexually-active-women-prone-cervical-cancer--expert/. [Last accessed on 2014 Sep 20]. Fadahunsi OO, Omoniyi-Esan GO, Banjo AA, Esimai OA, Osiagwu D. Prevalence of high risk oncogenic human papillomavirus types in cervical smears of women attending well woman clinic in Ile Ife, Nigeria. Obstet Gynecol 2013;3:185. Sar Mukaddam SB, Garad SG. Validity of assumption while determining sample size. IJCM 2006;29:2004-6. Karlsen F, Kalantari M, Jenkins A, Pettersen E, Kristensen G, Holm R, et al. Use of multiple PCR primer sets for optimal detection of human papillomavirus. J Clin Microbiol 1996;34:2095-100. Silva AM, Vilanova-Costa CA, de Oliveira SF, da Silva CC, Curado MP, da Cruz AD. Human papillomavirus detection and genotyping in squamous cell carcinomas of the larynx. J Virol Methods 2008;6:26. Auwal IK, Aminu M, Atanda AT, Tukur J, Sarkinfada F prevalence and risk factors of high risk human papillomavirus infections among women attending Gynaecology Clinics in Kano, Northern Nigeria. BAJOPAS 2013;6:67-71. Famooto A, Almujtaba M, Dareng E, Akarolo-Anthony S, Ogbonna C, Offiong R, et al. RPS19 and TYMS SNPs and prevalent high risk human papilloma virus infection in Nigerian women. PLoS One 2013;8:e66930. Aggarwal R, Gupta S, Nijhawan R, Suri V, Kaur A, Bhasin V, et al. 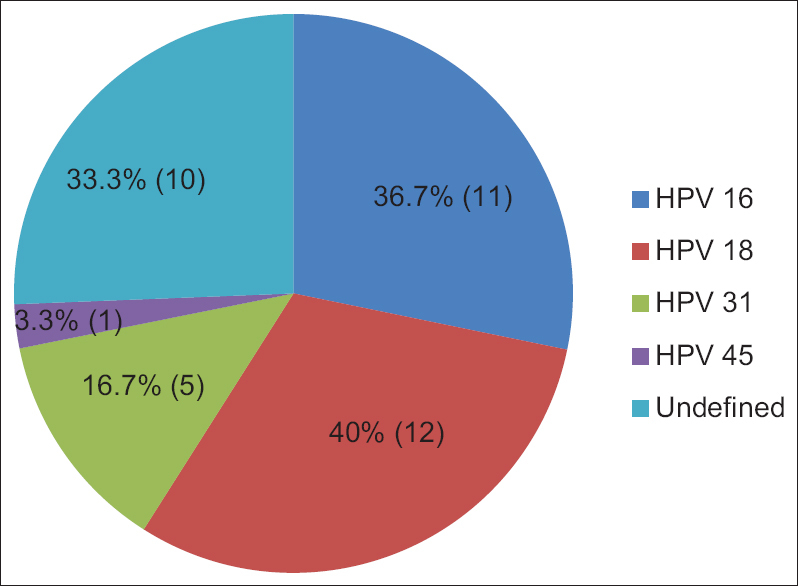 Prevalence of high – Risk human papillomavirus infections in women with benign cervical cytology: A hospital based study from North India. Indian J Cancer 2006;43:110-6. Mendoza L, Mongelos P, Paez M, Castro A, Rodriguez-Riveros I, Gimenez G, et al. Human papillomavirus and other genital infections in indigenous women from Paraguay: A cross-sectional analytical study. BMC Infect Dis 2013;13:531. Didelot-Rousseau MN, Nagot N, Costes-Martineau V, Vallès X, Ouedraogo A, Konate I, et al. Human papillomavirus genotype distribution and cervical squamous intraepithelial lesions among high-risk women with and without HIV-1 infection in Burkina Faso. Br J Cancer 2006;95:355-62. Vidal AC, Murphy SK, Hernandez BY, Vasquez B, Bartlett JA, Oneko O, et al. Distribution of HPV genotypes in cervical intraepithelial lesions and cervical cancer in Tanzanian women. Infect Agent Cancer 2011;6:20. Castellsagué X, Menéndez C, Loscertales MP, Kornegay JR, dos Santos F, Gómez-Olivé FX, et al. Human papillomavirus genotypes in rural Mozambique. Lancet 2001;358:1429-30. Gravitt PE, Kamath AM, Gaffikin L, Chirenje ZM, Womack S, Shah KV, et al. Human papillomavirus genotype prevalence in high-grade squamous intraepithelial lesions and colposcopically normal women from Zimbabwe. Int J Cancer 2002;100:729-32. Xi LF, Touré P, Critchlow CW, Hawes SE, Dembele B, Sow PS, et al. Prevalence of specific types of human papillomavirus and cervical squamous intraepithelial lesions in consecutive, previously unscreened, West-African women over 35 years of age. Int J Cancer 2003;103:803-9. Centre for Disease Control and Prevention Human papilloma Virus infection; 2015a. Available from: http://www.cdc.gov/STD/HPV/STDFact-HPV.htm. [Last accessed on Oct 13]. Dochez C, Bogers JJ, Verhelst R, Rees H. HPV vaccines to prevent cervical cancer and genital warts: An update. Vaccine 2014;32:1595-601. Center for Disease Control and Prevention. Use of 9-Valent Human Papilloma Virus Vaccine: Updated HPV Vaccination Recommendations of the Advisory Committee on Immunisation Practices; 2015b. Available from: http://www.cdc.gov/mmwR/preview/mmwrhtml/mm6411a3.htm. [Last accessed on 2016 July 19].